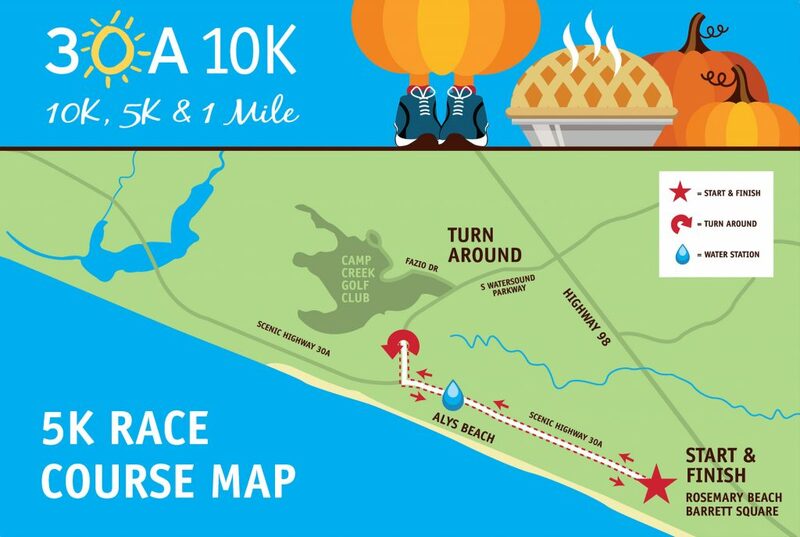 Are You Ready for the Annual 30A Thanksgiving 10K? Show your community spirit and have a blast with family and friends at 30A’s 7th annual Thanksgiving Day Races on November 21 and 22, 2018. What Are the 7th Annual Thanksgiving Day Races? Every year, the 30A 10K Thanksgiving Races bring together people from all over our communities. The fun starts the day before Thanksgiving – this year, it’s November 21. From 12 p.m. to 7 p.m., you can pick up your race packet, shirt and bib before you dive into the race expo at The Hub, an outdoor marketplace featuring shops, restaurants and live entertainment for the whole family. On Thanksgiving Day, Highway 30A closes to traffic from 7 a.m. to 10 a.m. so thousands of runners can participate safely in one of three races: a 10K, a 5K and a 1-mile Fun Run. All proceeds go to four amazing charities: Sandcastle Kids, the Seaside Repertory Theatre, the Walton County Cultural Arts Alliance and the Choctawhatchee Basin Alliance, which all help support healthy and well-rounded local communities. The Thanksgiving Day Races have raised more than $250,000 for local nonprofits over the past several years. The race organizers ask that you register in advance and pick up your packet on the 21st at The Hub. There’s no race day registration, and race day packet pick-up is reserved for emergencies only. 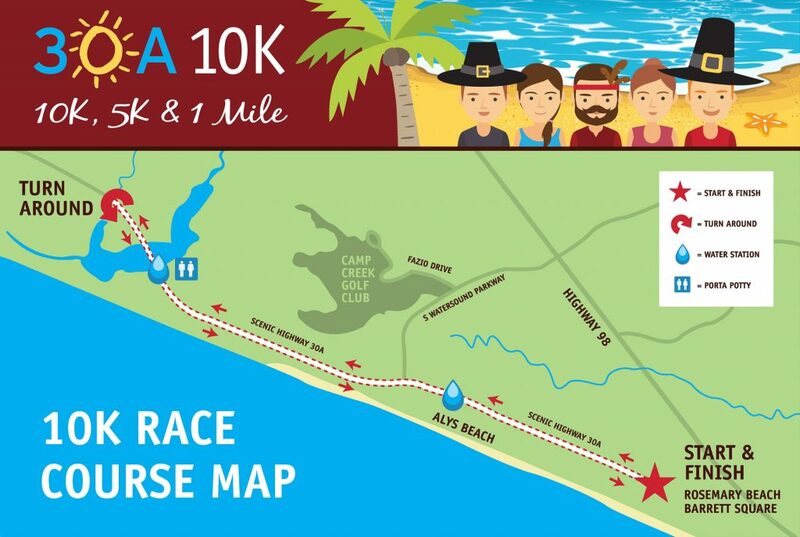 Remember that 30A shuts down between 7 a.m. and 10 a.m. on race day, so if you park along the race route, you won’t be able to leave until the highway reopens. Dogs aren’t allowed in any of the races. Family and friends are welcome to watch anywhere along the course, and they’re invited to the post-race breakfast. They can also volunteer to help in several areas, get great photos with Lucky, the 10K mascot, and shop throughout the morning. Awards include male and female prizes in three categories: Overall, Master and Grand Master. There are age-specific awards in the 5K and 10K races, as well, ranging from participants under 10 and those over 80. All finishers for each race receive a signature keepsake medal, as well. All runners receive a race tee, a reusable bag, and a swag bag filled with special discounts and coupons. Are You Participating in the 10K, 5K or 1-Mile Fun Run? 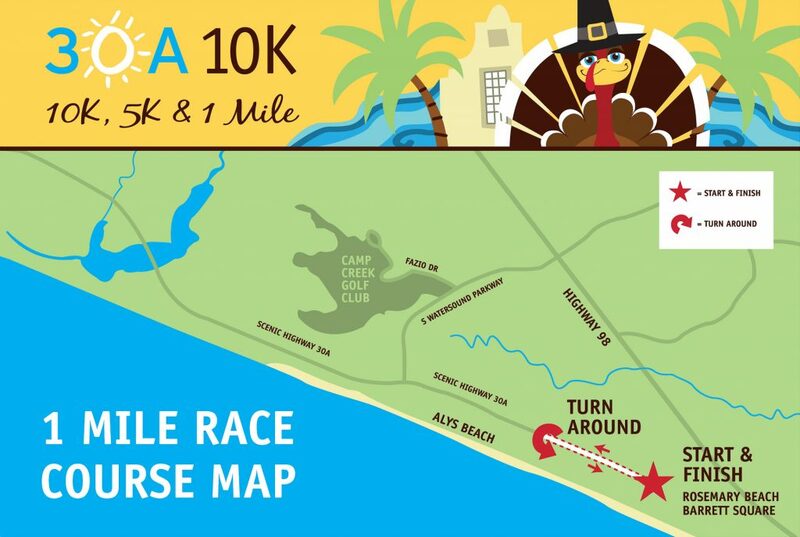 You can register for the Thanksgiving Day Races at 30a10k.com. Each beach town along 30A is part of an amazing community – one that comes together for great events like this and one that pulls together to help others when necessary. If you’re thinking of buying a home along 30A, we can help you find the perfect place to live. Call us at 850-213-3048 or get in touch with us online to tell us what you’re looking for – we’ll help you find it. All photos by Shelley Swanger Photography.